A business process diagram (BPD) graphically depicts the steps taken to complete a process, such as issuing an invoice to a customer. The intent is to give readers a simplified, easy-to-understand overview of a process, which can then be used for training purposes, to configure an improved process flow, or to standardize the use of a process. A minimal number of symbols are used in a BPD, usually just a rectangle to describe activities and arrows to indicate the flow of activities. The diagram reads from left to right and from top to bottom. 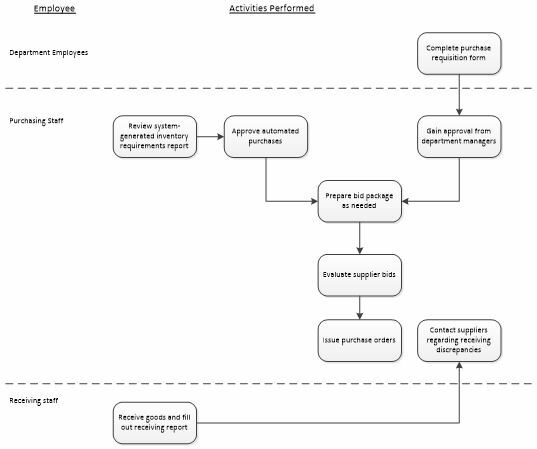 A sample business process diagram for purchasing follows.